Dark chocolate cake, chocolate ganache, espresso mascarpone cream and edible flowers...what could possibly be better? 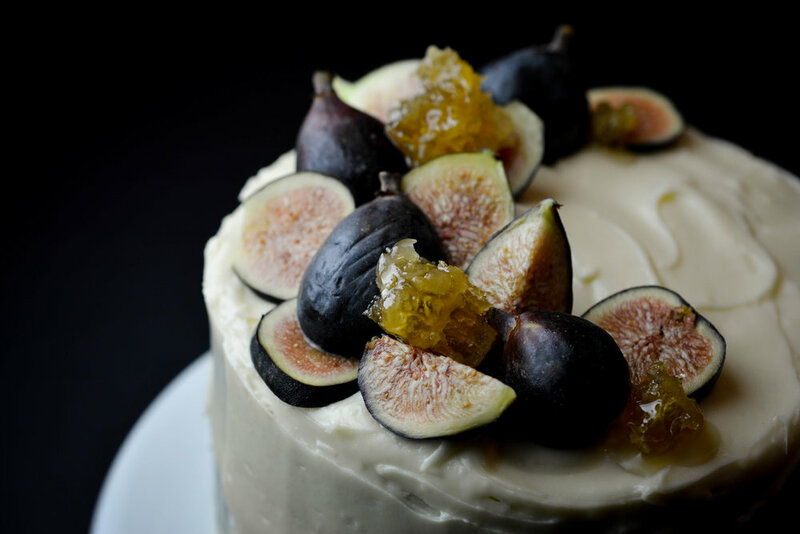 Warm spices, fresh figs and fig jam pack tons of flavor into this beautiful layer cake, which is topped with a honey cream cheese frosting, more figs and honeycomb. This classic French strawberry cake has a delicate vanilla genoise, vanilla creme patissiere and tons of fresh strawberries. The perfect cake for early spring. This floral cake is filled with lemon curd and fresh strawberries, and frosted with a chamomile chantilly cream colored with freeze-dried strawberries. With Italian acacia honey cake layers, a spiced pear and white wine filling, and a creamy goat cheese buttercream this cake beautifully blends a variety of fall flavors. The fall theme continues in the handmade gilt-chocolate branches that wrap around the exterior. 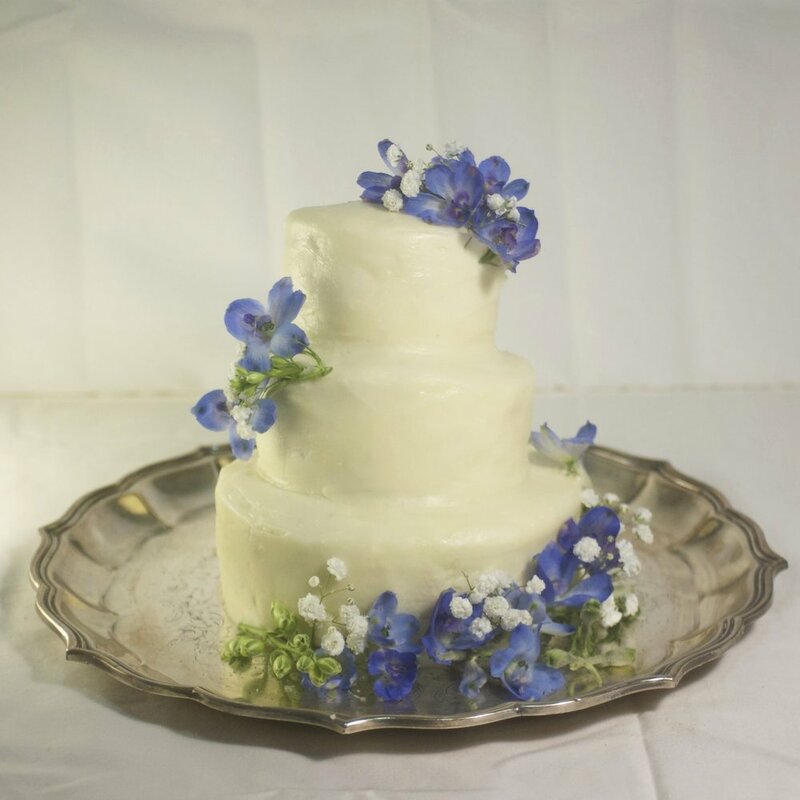 This three-tiered beauty may look classic, but beneath those sprigs of blue flowers there's a surprisingly modern cake. Each tier is composed of a honey and spice cake, filled with white-wine poached pears. But the real twist is in the frosting--goat cheese buttercream just tangy enough to push this elegant cake into the 21st century. A vintage burnt sugar and maple cake, frosted with maple buttercream and decorated with gold maple leaves, this cake is for serious maple lovers only! The perfect ending to a fall-themed wedding. 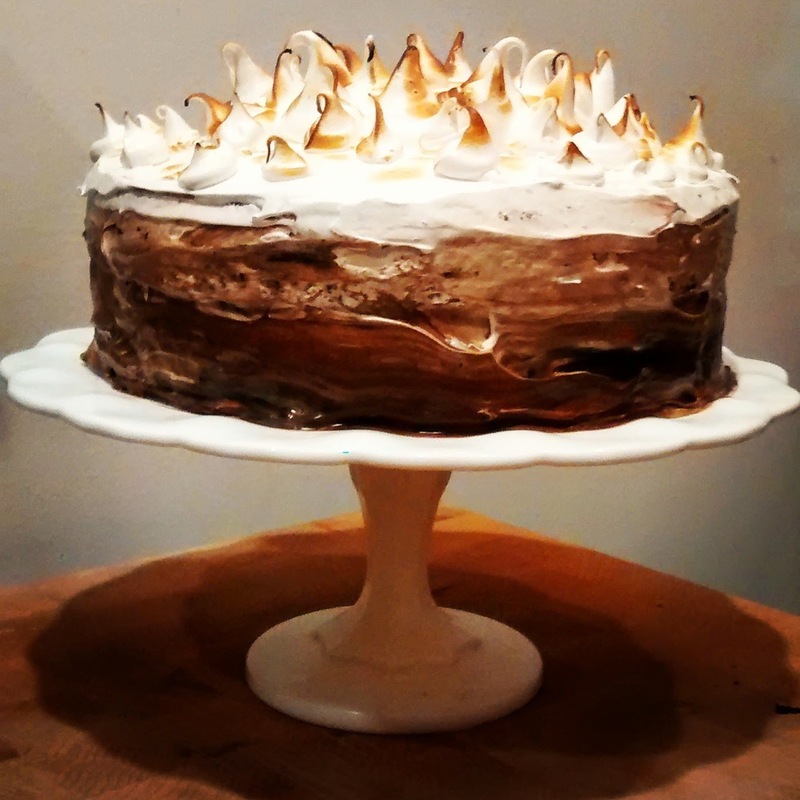 Graham cracker cake layers smothered in milk chocolate ganache and covered in a burnt marshmallow frosting. Credit to Smitten Kitchen for the recipe. This nontraditional yellow cake is frosted with toasted sugar vanilla buttercream and decorated with yellow edible flowers. Who says vanilla has to be boring? This Marie Antoinette-inspired pistachio cake is filled with a raspberry rose mousse and covered in white chocolate ganache. Gilded white chocolate vines evoke the work of 18th century French artist, Pierre Gouthiere. A cake fit for a king (or queen)! This understated chocolate cake--covered in vanilla bean buttercream and decorated with gold-dusted raspberries and gilt-chocolate leaves--proves that sometimes less is more. Until it comes time for serving that is! 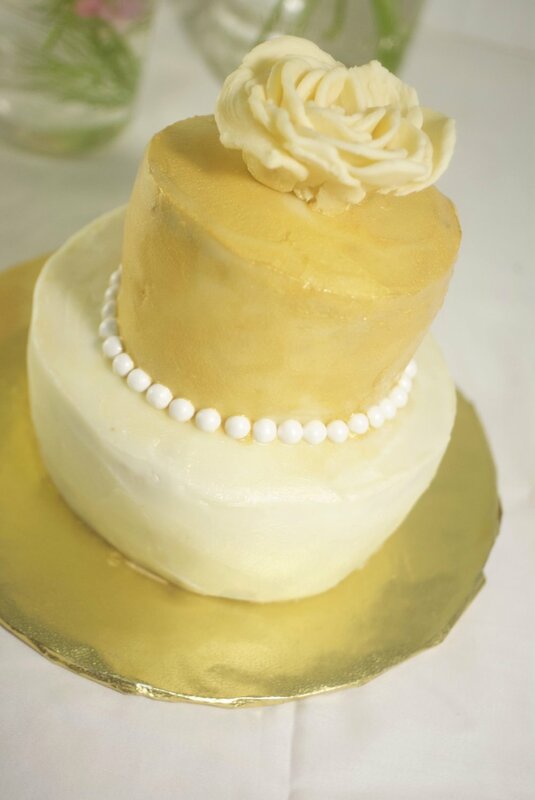 Everything about this cake--from its white chocolate rose topper and pearl decorations, to its gold and white color scheme--exudes timeless elegance. With a modern two-layer structure and gold-tinted frosting this cake strikes the perfect balance between something old and something new. 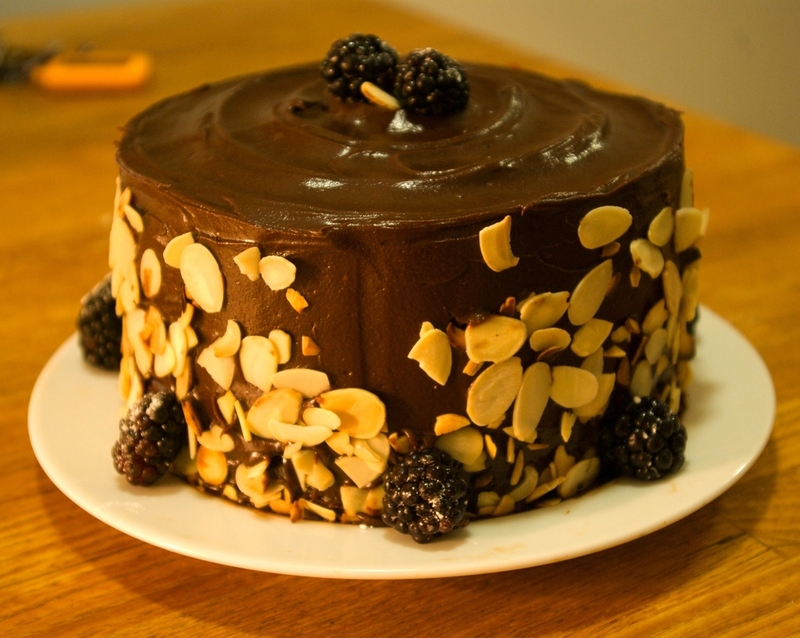 Tart blackberry jam, warm spices (cinnamon, nutmeg and clove), crunchy almonds and a double layer of luscious bittersweet ganache...this cake has it all. For when too much is just not enough. Honey cake filled with a whipped mascarpone mousse and topped with candied rose petals, pistachios and honey drizzle. What could be better than cream puffs stuck together with caramel and covered in spun sugar? Chocolate mousse-filled cream puffs of course! A rooibos infused cake with honey rose buttercream and candied rose petals. The "I Want Chocolate Cake"
Chocolate cake with chocolate Earl Grey mousse and fresh blackberries makes a compelling argument for occasionally gilding the lily (or blackberry).